Simms Pro Wading Staff has an adjustable length from 52 to 56" and is a must for any angler that needs some extra stability wading. The Pro Wading Staff from Simms is lightweight and rigid. Simms Wading Staff is made of durable aluminum tubing and has an adjustable length of 52" to 56". The Wading Staff by Simms is a must for slippery rocks and rivers. Simms Wading Staff Retractor extends up to three feet and the cable is very strong. 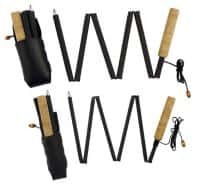 The Wading Staff Retractor by Simms connects to the staff strap and the sheath. Simms Wading Staff Rubber Tip is quieter in the water than the aluminum tip. The Wading Staff Rubber Tip by Simms is compatible with both Simms' wading staffs and is perfect for those hike to fishing destinations. The TFO collapsible wading staff is made of either aluminum or graphite tubing and has a length of 54", 15" collapsed. The Wading Staffs by TFO have a camera mount on the handle. Folstaf Wading Staff is made by a small family-owned business specializing in fly fishing and walking products designed for our own outdoor needs. The Folstaff Wading Staff is great if you fish slippery or heavy water rivers.